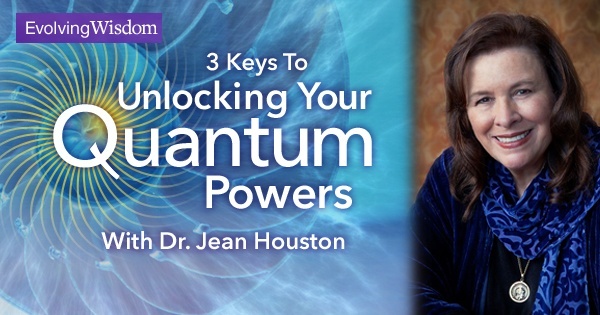 Dr. Jean Houston, former advisor to President Bill Clinton and Secretary of State Hillary Clinton, will be conducting a “new, leading-edge” 7-week Unlock Your Quantum Powers online course beginning on Wednesday, February 11. Update: This post was written one year ago. This year, the course will start on Wednesday, February 10th. It may be possible to register after the deadline as all the materials are available online. The link is still the same, so read on for more information. Jean recently held a free global online seminar where she introduced her 7-week training program to the world. So you can hear for yourself what she has to say about this program. And she can probably explain her own program much better than me🙂. You can access the replay of the webinar here. The replay will only be available for a limited time. At the end of the 7 weeks of this training program, we’re promised that a ‘mythic’ life awaits us. That we’ll not only be able to accomplish all the things we’ve always wished we could, but countless others we haven’t even dreamed of yet. For more details, or to be part of the first second small group of individuals to go through this training with Jean, click here. I can’t tell you now how good this thing is, because I’ve yet to go through the course myself. But listening to Jean’s recent global webinar, and subsequently doing a bit of research on this course, is inspiring to say the least. From the outside, this seems like something that could take me (and you) to the next level. I have registered myself and paid for it (this course has a 30-day, no-questions asked, money-back guarantee), and generally feeling pretty excited about all this. If you’re interested in joining me, then click here. P.S. I went through this course with Jean last year and had absolutely no regrets. However, the cheapest option for this course is $397. If you feel that this is too pricey, yet is deeply interested to find a mentor who could guide you to the next level, then read my overview of Bob Proctor’s Six Minutes to Success program. That’s all from me today. Share this post with others if you have enjoyed or found it to be useful, and if you have any questions or comments in regards to this course just let me know in the comment box below and I WILL get back to you as soon as I can. See you around! I have always felt that we need to improve ourself before we can help improve others. I find your post on quantum powers intriguing. It is something new for me and I look forward in learning more from your other posts. Thanks, Nasrat, and I really hope you enjoy my other posts as well :).